It is just two days until the 50th anniversary of the first screening of The Man and the Hour, the episode that got Dad’s Army going. I doubt anyone imagined that the programme would continue for almost a decade. However nine years later, exactly 41 years ago today, the very last episode of Dad’s Army, Never Too Old, was recorded. Time had not been altogether kind to the show or the cast. The death of Jimmy Beck, four years earlier, had created a gap in the cast that would never be adequately filled. The rest of the main cast had all remained with the show but a number of them, most especially John le Mesurier, were showing signs of age or illness. When the last episode was shot, while no firm decision had been take to stop, most felt that they had arrived at the end and this was reflected in the story line of the episode. Never Too Old centres largely on Corporal Jones finally persuading the widowed Mrs Fox to allow him to make an honest women of her. 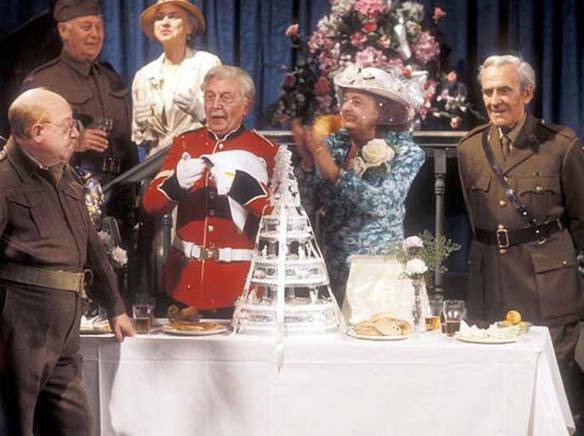 The wedding brings together all the main characters (except Captain Square, which seems a shame) for a ceremony and reception at Walmington church and hall. But military responsibilities can’t be shirked and as soon as the toasts are over they are back on patrol. An unwelcome run-in with the ever-abrasive Hodges leads the platoon to question whether the Home Guard could ever cope if the invasion was to happen – a moment of self-doubt that Mainwaring is quick to squash. But it leads them to raise a touching toast ‘to Britain’s Home Guard’ in the closing seconds. Just writing about it is giving me goosebumps for, even though slightly contrived, it is a moving moment paying homage not just to a wonderful television programme coming to an end, but also to the men of the real Home Guard who served with little hope of success at a time of terrible national danger. This entry was posted in blog on July 29, 2018 by wolAdmin.